Wrigley Building, downtown Chicago, IL exhibits the CFW fiberglass Orbs for the Light Nights on the Magnificent Mile celebration. 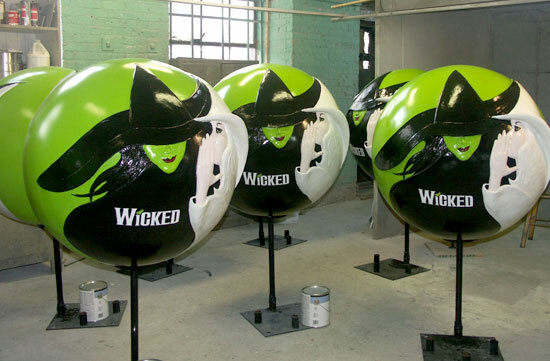 A project for Broadway in Chicago—25 "WICKED" sculptures were displayed on State Street November 2008. Our 7' long fiberglass Polar Bear Bench provides a great seating alternative. 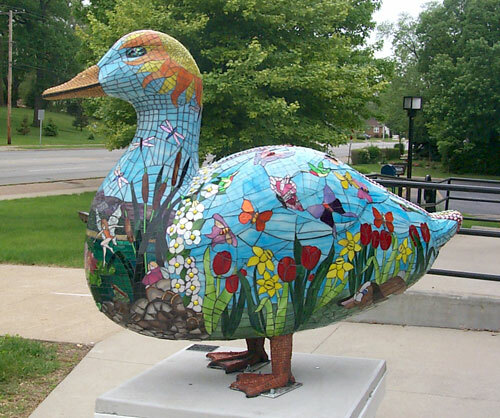 The CFW contribution to the fiberglass duck parade. Conversion of the fiberglass duck into a seat. We also have the opposite side available for bookend display. 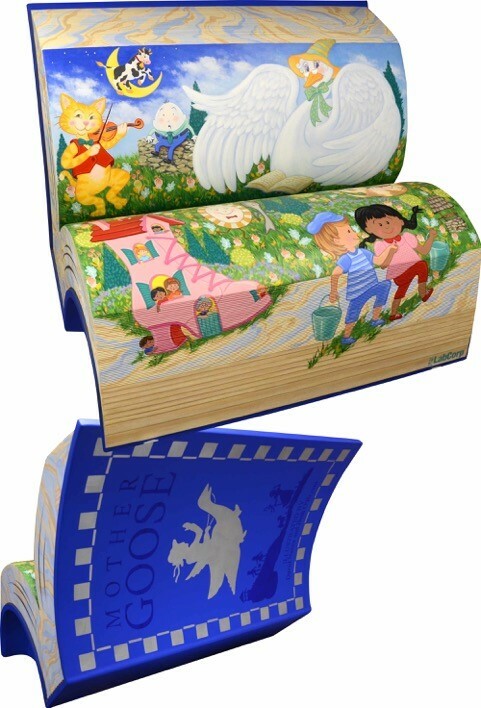 Fiberglass duck seat is a creative way to make the fiberglass art interactive. Fiberglass Orbs lining the Magnificent Mile. 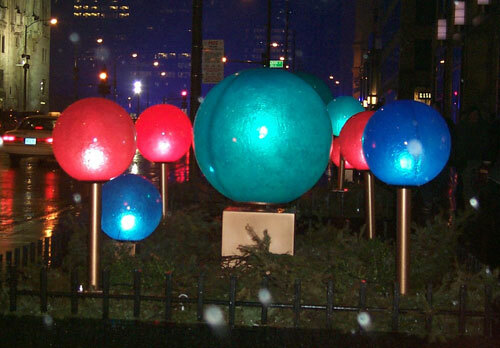 Some 400 various sized fiberglass spheres with internal lighting are used to highlight the winter season in downtown Chicago. CFW created 48", 36",24",18" and 12' fiberglass spheres with a variety of paint designs. 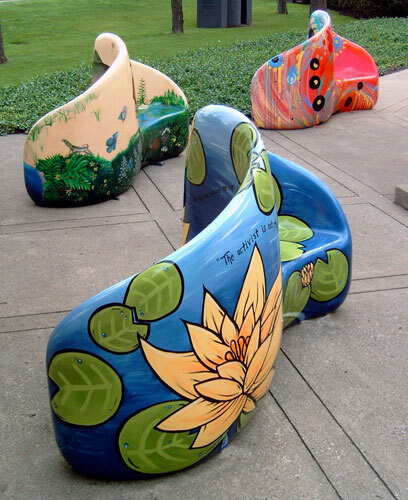 Lake County, Porter County and La Port counties participated in the exhibit of painted fiberglass seating throughout northern Indiana. Our fiberglass train engine is 6' long x 45"tall and 31" wide. These were produced for The Northwest Connecticut's Chamber of Commerce to raise funds for the local children's museum and for the NW Community Collaborative, Inc and the Education foundation. Our fiberglass cookie is 54" tall. Our stable of 6' tall herkies went to the town of Iowa City were they were decorated to commemorate 10 years since Herky was first launched as a public art event. Our fiberglass Herky is 6' tall. St. Joseph Michigan 2015 art exhibit Splishin' and a Splashin' Art bubbling up in St. Joseph! Glencoe Historical Society contracted fiberglass public art designed by Frank Lloyd Wright. These are scaled down reproductions of the Ravine Bluff Markers in Glencoe. Beach Bugs, the 2016 theme for the City of St. Joseph, MI. Chicago Fiberglass Works creates custom fiberglass public art exhibits for communities throughout the United States. Our promise to our clients is to provide the best service and the best fabrication methods available. CFW has the capabilities to create your sculpture from a simple sketch or a detailed 3-D cad file or even a miniature 3-D model. Fiberglass Public Art—creating a quantity of giant custom sculptures from a mold—is a specialty niche market for Chicago Fiberglass Works. 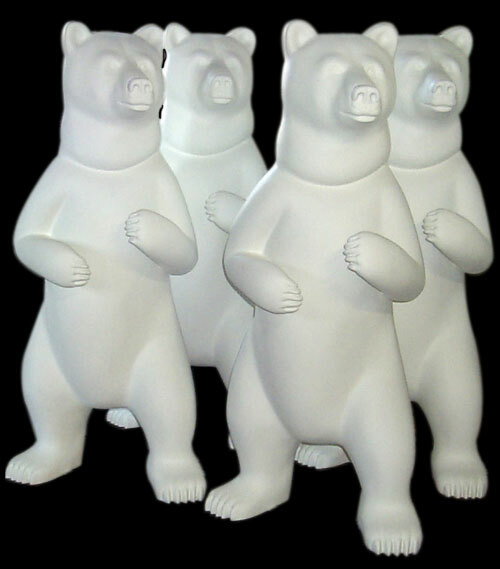 We bring our extensive background of fiberglass fabrication to the world of 3-dimensional artwork. No project is too large or small for our staff and artisans. We have built the Penn State Nitany lion, the Iowa Hawkeye Herky, the Kansas State Wildcat, the Washburn University Ichabod, the Butler University Bulldog, the Gwinnett County Public Schools Bulldogs, and many more. Chicago Fiberglass Works is located on Chicago's west side with over 30,000 square feet of production space. The Albarran family has been creating fine custom statuary and furniture for over 60 years in Chicago. We welcome you to visit our facility and talk with Joe or Paul Albarran regarding your project.